Former UN Secretary General Kofi Annan says he would not describe the violence being committed against Myanmar's Rohingya minority as "genocide". "I think there are tensions, there has been fighting, but I wouldn't put it the way some have done," he told the BBC after a trip to Rakhine state. Humanitarian groups now say that 21,900 Rohingya have fled to Bangladesh in less than two months. Malaysian Prime Minister Najib Razak on Sunday said genocide was taking place. The army launched a crackdown in northern Rakhine in early October after co-ordinated militant attacks left nine border policemen dead. Rohingya groups have alleged serious rights abuses, including rapes, shootings and house burnings, and say they are being targeted indiscriminately. The government of Myanmar, also known as Burma, strongly denies the allegations. 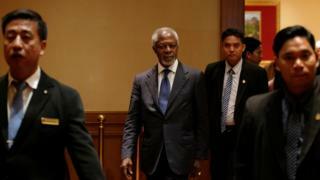 Mr Annan was asked in August by Myanmar's de facto leader Aung San Suu Kyi to head a commission looking into tensions in Rakhine state, where the Muslim Rohingya live alongside the mostly Buddhist Rakhine people, who are the state's dominant ethnic group. "You can feel both communities are afraid. There is fear, there is mistrust. The fear has heightened but we need to find a way of breaking that down and beginning to encourage the communities to connect," he told the BBC. He said that observers should be "very, very careful" in using the word genocide. Ms Suu Kyi, a Nobel Laureate who endured years of house arrest under Myanmar's military junta, has faced international criticism for failing to help the Rohingya. The Rohingya people trace their ancestry in the area back generations, but are not recognised as citizens and tens of thousands live in camps where travel is restricted. But Mr Annan said Ms Suu Kyi's government, which won a historic election last November, should be given "a bit of time, space and patience". The Rohingya have been making perilous crossings over the Naf river to seek refuge in Bangladesh, where hundreds of thousands of the group already live. The new figure of 21,900 people having fled - based on statistics collected by various groups and provided to the BBC by the International Organization for Migration - is more than double that given by the UN refugee agency last week. Bangladesh has stepped up security on the border in response to the migrant flows, and has been criticised by Amnesty International for pushing hundreds of Rohingya back across the border. Myanmar's Rohingya Muslims: Glimmer of hope at last?